For a long time I have held the conviction that Burnley could market itself as the walking capital of the UK. I can think of few towns of a comparable size where the countryside is so accessible – and not just any old countryside but countryside of considerable interest and variety. onto a track that skirts along the edge of a plantation. Follow the track for 800yds and then turn right as it takes you down to the B6238 East Burnley Road. 2. Ahead there is a fine view of Clough Bottom Reservoir. Cross the road, go through a wooden kissing gate and turn left onto a path that parallels the road taking you close to its junction with A671. Before the corner turn right as the path now parallels the Bacup Road for 350yds before turning to cross it at a wooden gate. 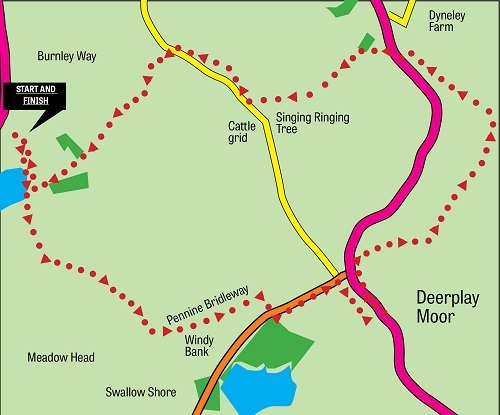 Still on the Pennine Bridleway turn left now paralleling the A671 on this side to reach the top of Easden Clough. turn left over a stile embedded in the wall. and then bear left following a stream through a steep sided clough to reach a stile in a wall leading onto the A671. the Singing Ringing Tree comes into view. Aim to its left for a stile that gives access to its enclosure. and keep ahead to descend to the utility building passed on the outward leg close to Clowbridge Reservoir.